Medical laboratory science is the study and practice of diagnostic medicine. A practitioner with appropriate education (ordinarily a bachelor’s degree) in the profession is called a Medical Laboratory Scientist (MLS). A medical laboratory scientist’s role is to provide accurate laboratory results in a timely manner. These results are used to confirm a diagnosis or to monitor treatment. Medical laboratory scientists perform tests that analyze blood, urine, tissue, or other body specimens. These professionals perform, develop, evaluate, correlate, and assure accuracy and validity of laboratory data. Medical laboratory scientists practice independently and collaboratively and are responsible for their own professional actions. The ability to relate to people, care about patient outcomes, and display calm and reasoned judgment are essential qualities. Although medical laboratory scientists seldom have personal contact with patients, they play a major role in disease diagnosis and in monitoring therapy. They work closely with physicians, researchers, and other health care professionals. The mission of the Medical Laboratory Science (MLS) program is to provide a baccalaureate-level educational program that prepares individuals for a career in the laboratory science profession. Integrate knowledge from the humanities, social sciences, natural science and medical laboratory science to demonstrate professional MLS practice. Collaborate and integrate with members of the healthcare team to facilitate caring behaviors to meet the needs of patients in different health care settings and delivery practices. Demonstrate technical competency in the delivery of quality laboratory service in all areas in the scope of medical laboratory practice. Display a commitment to the role and the development of the medical laboratory professional. Apply theory and principles related to body fluids, blood bank, chemistry, hematology, immunology, and microbiology laboratory testing. Explain the fundamental biological characteristics related to laboratory testing. Perform a wide variety of laboratory tests. Recognize sources of error in laboratory testing. Use appropriate quality control and quality management procedures to ensure the accuracy of laboratory testing results. Assess the accuracy of laboratory test results by correlating laboratory data with clinical diagnoses. Evaluate and apply appropriate corrective actions when problems are encountered. Apply management principles to the medical laboratory environment. Accurately report patient test results. Demonstrate professional conduct when communicating with patients, laboratory personnel, other health care professional, and the public. Students enrolled in the MLS program complete all general education courses before they begin the MLS-specific coursework. All required MLS coursework is completed in one calendar year. Students receive the Bachelor of Health Sciences degree with a MLS major and qualify for MLS certification upon completion of program requirements. This option is also possible for those who already have a baccalaureate degree and have completed all general education courses. This track has a summer start date, and is offered in a blended delivery format (online delivery of coursework with some on-site visits to campus). Clinical rotations are completed at a clinical laboratory facility. Upon satisfactory completion of the program and completion of baccalaureate degree requirements, graduates are eligible to sit for the national certification exam offered by the American Society of Clinical Pathology–Board of Certification (ASCP-BOC). 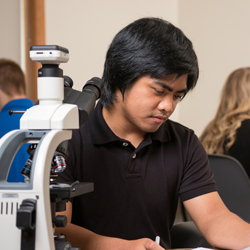 The Allen College Medical Laboratory Science Program is accredited by the National Accrediting Association of Clinical Laboratory Sciences (NAACLS).